Contemporary painter, Adelio Bonacina was born in Vercurago in 1950, lives and works in Olginate in the province of Lecco. He entered the graphic sector in 1969 attending the applied art school of Merate. Flanked by various masters of all respect and inspired by their artistic attitudes, in 1975 he left the graphics and tried his hand at oil painting. 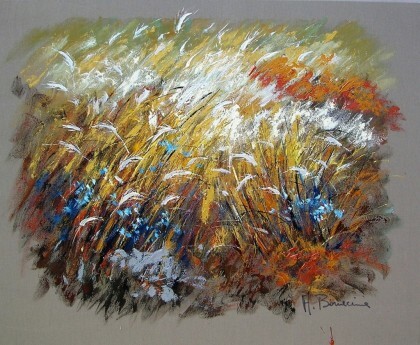 After various experiences, in the early 90s he chose to post studies and oil works with mixed and acrylic techniques. Landscapes and panoramic views of rare and high suggestion, portraits and figures of strong emotional intensity, informal works of advanced expressive and conceptual modernity. This, in a nutshell, is the artistic world of Adelio Bonacina, a painter of great talent and consolidated experience, professionally active in the field of graphics from 1969 to 1975, when he suddenly decides, but also with full awareness and foresight, to devote himself to time. full of art and, more specifically, painting. In these years, Bonacina has exhibited in several exhibitions and exhibitions of paintings, both personal and collective, from Villa Borromeo di Arcore, just to do some dutiful example, at Palazzo Prinetti in Merate, from Erba to Lecco, from Bergamo to Portovenere in Liguria, from Treviglio to Cesenatico, from Udine to Noli, from Trieste to Forlì, as well as participated in numerous prizes and competitions of great fame and absolute prestige, such as the National Award ?Emilio Gola? or the National Competition ?Fratelli Agazzi ?, obtaining in many cases areas and important acknowledgments of his work and his specific artistic personality, including a high profile critical-artistic report by a highly respected jury, composed of none other than Carlo Castellaneta, Raffaele Crovi, Raffaele De Grada, Mario De Micheli, Bruno Munari and Aligi Sassu, at the ?Premio Arte? Mondadori of 1986 with the opera Borgo antico.